of the light, yellow buses progress, leave their lots. A small moment that points merely to wrens and yellow school buses, and yet it delights. Wrens are passerine: the structure of their feet allows them to perch easily, and they are omnivorous. Wrens are built for survival. In Dungy’s poem, the wrens individually restore and animate their sma ll lives (their portion) and their portion of that avatar for everything life-giving: the light, which also bears connotations of everything from perception, optimism, security and joy, to divine grace. (Not to mention just plain ol’ sunshine.) The wrens revive the light by being only what they are: birds doing the daily things that wrens do. The poem draws an unspoken connection between the wrens and human life. Like our avian counterparts, we bring our portion to life in the same small, unassuming, wren-like ways. We resuscitate our lives by living them. A single wren can enliven light: such hubris, such power. But the yellow school buses are also part of this image. The poet as a new mother contemplates the arrival of her own child and the fecund natural world. 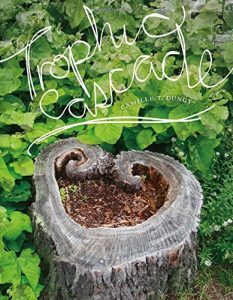 Children and motherhood center Dungy’s Trophic Cascade. “How Great the Gardens When They Thrive” turns seamlessly, as if by dream logic, from the connotations of light—bright, warm, sunny, yellow—to yellow school buses, metaphorical stand-ins for children, families, schools, and the future. Dungy writes, however, that the school buses progress—how formal and bureaucratic the word seems. The buses, the future, the lives of our children progress, move forward. But “progress” must be a word that might break a mother’s heart: a child progressing, growing up, growing away. I read the lines again and think of wrens, wildness, flight, and the reinvigorated light, and I imagine the opposite state, suggested by school buses: order, system, schedules, staged growth, the loss of neighborhood schools, and the future painted in a cheery primary color. How easily one state dissolves into the other. “How Great the Gardens When They Thrive,” from Camille T. Dungy, Trophic Cascade. Wesleyan University Press, 2017. This entry was posted in A Space for Image on September 4, 2017 by admin.